American Idol Predictions: Who will Win American Idol 2018 Season 16? Home Television American Idol American Idol Predictions: Who will Win American Idol 2018 Season 16? American Idol 2018 Season 16 has just reveled the Top 3 Grand Finalists on Sunday. Only one thing to find out…. Who will be named American Idol? The Top 3 finalists competing for the Season Finale of American Idol 2018 are Caleb Lee Hutchinson, Gabby Barrett and Maddie Poppe — they earned the Grand Finale ticket after receiving the highest votes from the public. 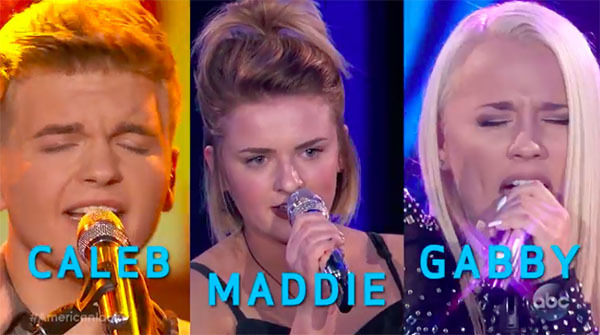 Caleb Lee Hutchinson, Gabby Barrett and Maddie Poppe will compete for American Idol Season 16 title in the two-night grand finale on Sunday and Monday (May 20 – May 21). Who do you think will be the next American Idol? Write your prediction on the comment section below. Also, please participate in our online Poll, vote your American Idol Season 18 winner on the poll below. Who will be named American Idol? Next articleThe Voice Predictions: Who will Win The Voice 2018 Season 14?